The centre in Romford is part of the Council’s multi-million pound investment in sport and leisure facilities. Since opening in February 2018, over half a million people have come through the doors to enjoy ice skating, swimming and much more. The centre is part of the Council’s multi-million pound investment in sport and leisure facilities. This has also included the £1.5m refurbishment of the Central Park Leisure centre in Harold Hill and a new leisure centre and swimming pool due to open in Hornchurch in 2020. 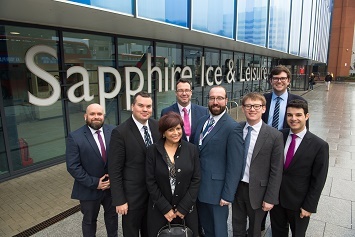 Sapphire Ice & Leisure, named in tribute to mark 65 years of the reign of Queen Elizabeth II, has also seen around 3,400 people become fitness members during the first 12 months. There has been around 76,650 people of all ages enjoying ice skating and 131,800 coming into the centre for a swim, with over 1,000 receiving swimming lessons on a weekly basis and over 400 people learning to skate. The centre, which is managed by Everyone Active on behalf of the Council, has also seen approximately 41,000 people using the facilities for an exercise class. The centre is also home to the Raiders Ice Hockey team, who regularly play to packed audiences of around 500 people. “It has been a very successful first year for Sapphire Ice & Leisure. Over half a million people have visited, which proves just how popular it is. “Residents and visitors are able to visit a facility that has something for all ages. It offers you a chance to get fit and active plus enjoy yourself, whether it is swimming, ice skating, the gym or an exercise class. “It’s been a great first year for Sapphire Ice and Leisure. We’re proud of our partnership with Havering Council, which has delivered such a fantastic facility.